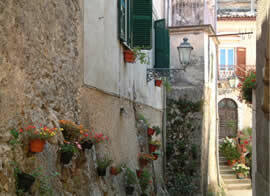 Picinisco is one of many hilltop villages located in the Val Comino of the Lazio region. 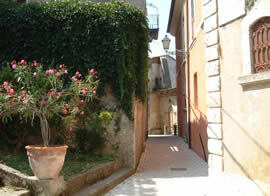 It is south east of Rome, in the Abruzzi mountains of the Apennines and the nearest town of any note is Cassino. Located on the very border of the National Park of the Abruzzi, its population is about 1200 (including its neighbouring hamlets of San Gennaro, San Giuseppe), but in the summer months it is much larger as emigrants and their families return. At 720 metres above sea level, Picinisco affords some protection from the stifling heat in the valley, especially at night. The name Comino possibly derives from the Samnite town of Cominum which the Romans sacked in 293 BC, taking control of the entire valley. The Picinisco district of the valley was certainly inhabited by the Romans. Two stone fragments with funereal inscriptions were found in the early 19th century in the Church of Santa Maria on the slopes approaching the village. The inscriptions date back to the first century BC and one of them refers to the 'gens' Plancia, one of four prominent Roman families of the area. The church itself is first mentioned in a document in 1110 AD (also the date of its construction) where it is listed as belonging to the diocese of Sora. 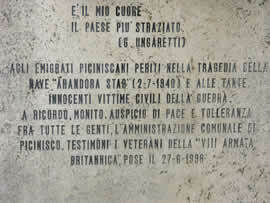 The area around Picinisco was given by the Longobard Duke of Benevento in 744 to Monte Cassino but there is no mention of the name Picinisco itself. This area, in turn, was given to the Benedictine abbey of San Vincenzo di Volturno in 866 by the Emperor Ludovic II after an expedition against Saracen incursion further south. It is likely that the peasant farmers in the area at this time lived in isolated communities and had no need - yet - to seek the security offered by grouping themselves together, higher up on more defensible slopes. The Coming of the Saracens. The first recorded incursion by the Saracens in the area took place in 881 when the abbey of San Vincenzo di Volturno was destroyed and then, two years later, the same fate befell the abbey of Monte Cassino. From now onwards the local inhabitants found it necessary to organise themselves into fortified, walled communities for self-protection. The construction of the castle in Picinisco began in 1054. The first dwellings in the environs of Picinsco were located in the hamlet today known as Immoglie but then was called San Valentino, based around the church of San Valentino, which was also razed by the Saracens at some point prior to 894.. The ruins of this church were discovered by Dionigi Antonelli in 1984. It is clear from this that it was the lower, flatter parts of the area which were first settled. The date 1017 marks the first documented appearance of the name Picinisco when the Princes of Capua gave the hamlet of San Valentino ('in the locality of Picinisco') and its surroundings to their brother, the abbot of Monte Cassino. Picinisco. The name itself, Picinisco, has no definitely discernible origins. One traditional possibility is that it comes from the name of Pecenisco, who might be described as a 'naturalised' Saracen captain and founder of the walled town. There is evidence nearby in the name of the town of San Biagio Saracinesco of a strong Saracen presence in the immediate area. In 1054 it became a walled, fortified hamlet as its designation in Latin changed from 'locus' (an inhabited place) to castellum in a document dated in that year. Effectively, castellum indicates an inhabited area surrounded by a wall, guard towers and gates. This change was brought about by the short-lived rule of the Counts of the Marsi for whom Picinisco formed the north-east boundary of their domain. Picinisco's Five Gates. One of these gates is the Porta Saracina (the Saracen Gate) with its Via Porta Saracina. This was at the time the only point of entry from the Val Comino into Picinisco, on the southwest wall of the village. The other four gates include the Porta Codarda, located on the northwest wall, and the Porta Rione, situated in the southeast sector and approached from the Parco Montano. To the left of the gate is first tower of the castle. From the main piazza at the southernmost part of the castle are two further gates. The older is the Porta della Prece, built in 1711, as can be seen from the date on the keystone of the arch. Just before this, directly leading onto the piazza (today called Piazza Ernesto Capocci) is the Porta della Piazza, constructed in its present form in1838. The Medieval Castle. The castle has four towers. There is a central keep, which dates from the 15th century, was built around the earlier 11th century, smaller tower. This became evident after the Allied bombardment of January 1944 revealed the smaller inner tower. In addition, there is another round tower to the south, a rectangular one to the right of the entrance and one more to the northeast. 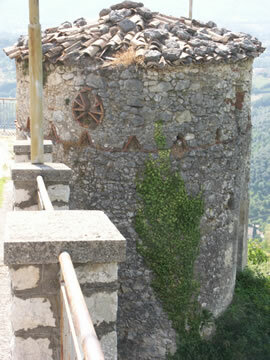 Another defensive feature of the castle is the 11th century torretta (small tower) to the northeast. Until a few decades ago, before the new road was built, this lookout tower stood on its own on a rocky outcrop. Now the road obscures much of it. The Church of San Lorenzo. Within the medieval walls is the church of San Lorenzo. The first church on the site was built in 1305 but it has since been enlarged many times and its current structure dates from the 18th century. Its attached 11th century bell tower, on the other hand, retains all its original medieval characteristics. However, given the military features (such as loopholes), it is likely that it was originally a lookout tower for the castle's main tower, and was subsequently adapted for use as a bell tower. Banditry. The Val Comino was prey to acts of banditry from local criminal bands, so much so that in 1821 the mayor of Picinisco ordered all the gates of the village, bar one (the Porta della Piazza) to be blocked up. The Porta della Piazza was to be guarded permanently and its large door shut at night - something which occurred every night, even as late as the 1930s, according to local historian, Dionigi Antonelli. Another type of banditry was perpetrated in 1873 after an earthquake dislodged some of the battlements of the keep. 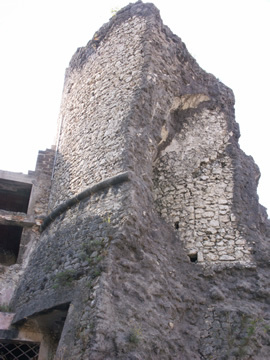 The owner of the castle and its attached buildings decided to dismantle the remaining stones of the battlements to use as steps for a stairway he was building. The only consolation is that he miscalculated and the cost of the demolition outweighed what he saved in materials. The Second World War. 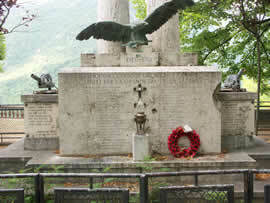 The German Gustav Line, with Cassino as its lynchpin, ran right through this area. 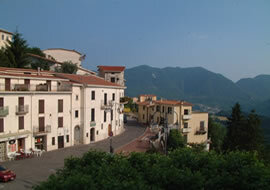 Picinsico was occupied by the Germans, as was the hamlet of San Gennaro, from where this author's family originated. The keep was used as an observation post with a machine gun for use against low flying Allied aircraft. It was bombed in January, 1944, by the Allies. The damage to it and the surrounding houses is still visible. Eight German soldiers and two civilians were killed. Some of the soldiers were not killed outright, and their cries for help from beneath the tons of heavy rubble of the keep were heard throughout the day but nothing could be done for them. Subsequent to this, the local German commander ordered the evacuation of the village. Anti-aircraft guns were also situated elsewhere in the locality. In San Gennaro, one of the houses was requisitioned by a German officer who spent some of his time drawing murals in the lounge which can still be seen today, as this author can testify. Some years later, long after the war, he returned to the house to admire his handiwork. 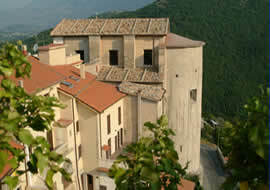 As for the castle, it remains since the 11th century a proud symbol of fortitude of the people of Picinisco. It has withstood acts of vandalism, earthquakes, and war but is gradually losing its last battle - against neglect and official indifference.